The rapid development of industrial infrastructure and expansion witnessed in the construction sector, primarily in the emerging markets, are fuelling demand for low voltage (LV) and medium voltage (MV) switchgear. With governments proactively investing in urbanization and rural development, renewal of existing transmission and distribution networks is on the cards. This is expected to create attractive opportunities for the LV and MV switchgear market. Transparency Market Research says that the global LV and MV switchgear market will exhibit a CAGR of 6.8% between 2016 and 2024. The market had a valuation of US$56.23 bn in 2015 and is expected to reach US$98.80 bn by the end of the forecast period. Growth witnessed by the market in developing countries such as Indonesia, India, and China in particular has been strong due to the accelerated electrification witnessed across these nations. The lack of adequate electrification has been inhibiting the growth of the industrial sector across emerging economies. To counter the situation, governments in India and China have adopted several approaches to improve grid connectivity in remote locations. A significant portion of the budget for such improvement plans has been allocated to urbanization, thus fuelling the deployment of smart grid technology. This subsequently translates into greater opportunities for sales of LV and MV switchgear in these countries. In the last few years, the market has witnessed positive growth globally. However, intense price-based competition between established and local players has been creating bottlenecks for the market. Besides this, the easy availability of substitutes for switchgear might also hinder sales of LV and MV switchgear. Nevertheless, in the near future, several countries located in the African and Asian sub-continent are expected to provide lucrative opportunities for the market. Furthermore, the increasing demand for renewable energy will also bolster sales of LV and MV switchgear in the forthcoming years. Regionally, Asia Pacific led the global LV and MV switchgear market in 2015, holding a share of 41.5% in terms of value. The rising demand for electricity transmission and distribution products in the industrial and construction sectors will boost the sales of LV and MV switchgear in the region. The high demand for switchgear and increasing price-based competition will seal Asia Pacific’s position as the key region in the global LV and MV switchgear market. In the same year North America emerged as the second-leading market for LV and MV switchgear. The region is currently witnessing increasing concerns related to greenhouse gas emissions, which has compelled North America to focus on renewable energy more than ever before. The increasing use of energy derived from renewable sources for electricity transmission and distribution in the region will fuel the demand for LV switchgear market in the near future. The major application segments of the LV and MV switchgear market include the pulp and paper industry, utilities sector, power plant, oil and gas, and petrochemical industry. The increasing investments in the construction sector and industrial infrastructure have boosted the demand for switchgear from the power and utilities sector. In terms of revenue, power plants emerged as the key application segment holding a share of 39.8% in the market in 2015. In the same year, the utilities sector held the second largest share in the market. Some of the leading players in the market are ABB Ltd. (Switzerland), Powell Industries Inc (U.S.), Siemens AG (Germany), Schneider Electric SE (France), Bharat Heavy Electricals Ltd. (India), Crompton Greaves Ltd. (India), Eaton Corp. (Ireland), Hyosung Corp.(South Korea), Mitsubishi Electric Corp.(Japan), GE Co. (U.S.) and OJSC Power Machines (Russia) among others. This report provides strategic analysis of the global LV and MV switchgear market, and the market growth forecast for the period 2016 to 2024. The scope of the report includes competitive analysis of various market segments based on the product standards, components, voltage ranges, insulation, applications and in-depth cross sectional scrutiny of the LV and MV switchgear market across different geographic segments. Growing demand for safety and protection regarding electric transmission and distribution in power, industrial infrastructure, real estate, utilities and construction sectors has fuelled the growth of LV and MV switchgear market. Increasing adaptation smart grid technology in power sector of both developed and developing countries will fuel the growth of LV and MV switchgear market during the forecast for the period 2016 to 2024. Rapid electrification in rural and urban areas of countries from Asia Pacific and Africa has triggered the growth of LV and MV switchgear market. In developed market, renewal of old and faulty transmission and distribution network has estimated to boost up demand for LV and MV switchgear market during the forecast for the period 2016 to 2024. Power plants fed with renewable energy sources are connected to 11kV lines or 33kV lines. In such context, increasing demand for integration of renewable energy sources in power sectors has positively impacted the demand for MV switchgears that are being used for safety and protection of electric transmission and distribution network. Installation of new electrical substations in power, utilities and oil and gas sectors is driving the demand for LV and MV switchgear in Middle East. However, bottom line growth of switchgear manufacturers has been negatively affected due to increase in extent of price-based competition in LV and MV switchgear manufacturer. 1kV - 5kV, 6kV - 15kV, 16kV - 27kV and 28kV - 38kV. Based on components, the LV and MV switchgear market is segmented into circuit breaker, relays and others (enclosure, fuses, bus bars and switches). By insulation, the market is divided into air insulated switchgear, gas insulated switchgear and others (oil and solid). Based on application, the LV and MV switchgear market is segmented into power plants, oil & gas and petrochemical industry, pulp and paper industry and utilities sector. Based on geography, the market is segmented in to North America, Europe, Asia Pacific, Middle East & Africa (MEA) and Latin America. 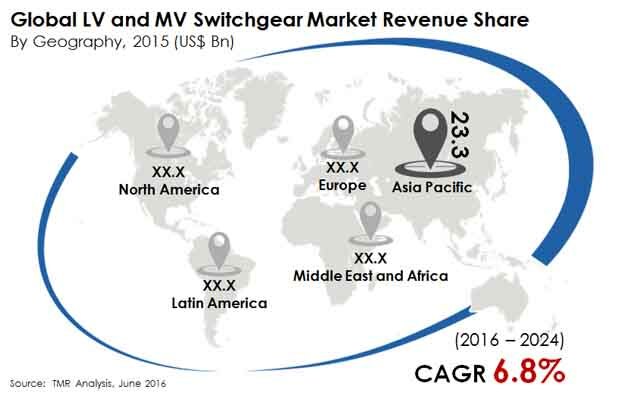 The scope of the report offers an insight into LV and MV switchgear market in these regions based on revenue (USD billion) and volume (thousand units). To aid in strategic decision making, the report also includes competitive profiling of leading players in the industry, their market share in different geographic regions (North America, Europe, Asia Pacific, Middle East & Africa and Latin America). Moreover, various business strategies adopted by leading players has also been discussed in the report. The market attractiveness analysis and Porter’s Five Forces analysis included in the report provide insight into market dynamics and industry competition. The report also provides breakdown and review of various factors affecting the market growth, which are appropriately described as market drivers, restraints, and opportunities. These factors determine various existing trends and their impact on market growth. In all, the report includes a holistic analysis of the global LV and MV switchgear market, and provides an estimate of growth for the period 2016 to 2024, keeping in mind the various factors affecting the market.